Kryptonian Warrior: Kryptonian Warrior's Multi-Movie Review - The World's End, Pacific Rim, Grown Ups 2! Kryptonian Warrior's Multi-Movie Review - The World's End, Pacific Rim, Grown Ups 2! Another week has past and a few more trips to the cinema have been accomplished! The much awaited third instalment of Edgar Wright's "Cornetto trilogy" (the first of which was Shaun of the Dead and the second being Hot Fuzz) is a very difficult film for me to review. I'm a huge fan of Shaun of the Dead, in fact it's one of my favourite movies of all time, and I also liked Hot Fuzz, but did I really like The World's End? Honestly I don't think so... not as much as I should have at least. I'm not sure where to start with it at all, maybe the lack of genuinely humorous moments, or the fact that when it actually produces laugh out loud one liners we're ten minutes away from the end of the film, or that the end of the film isn't what you expect at all and maybe doesn't fit. Maybe it's that the characters aren't as instantly likeable as in the first two from the trilogy, that the story isn't brilliant, the script feels forced and a little soulless, that the swearing and the potty humour feels dated and unnatural, the excess of choreographed fight scenes (although enjoyable) that don't feel real or feasible (for this film), and that the fully intended Easter eggs and nods to the other trilogy films are numerous but you almost feel like shouting "how dare you" at the screen for referencing those obviously more superior previous films. Maybe that's a step to far, but that was my impression. It could be any of these things above and to be honest that's such a shame. I regard the script, direction, editing, and acting from Shaun to be epic, next level, brilliant and Hot Fuzz to be a worthy sequel (although not truly connected by substance, just the team making the film). At World's End just ends up being that last movie that didn't really need to be made, the fifth wheel, that uninvited guest at your party... I could go on. It's not that the film isn't watchable, and it's not even that it's not good, it's just very flawed in its overall execution, and maybe a tad boring until you get well into the third act. I expected more, and maybe the high level I was expecting had already maxed out in Shaun. I would still say watch it if you're a Pegg and Frost fan (as I am) and if you liked Shaun and Hot fuzz, but don't get your hopes up that it'll be anything like the first two. First off, is this film good or bad? - Good more than bad! Would a non-fanboy/fangirl enjoy it too? - I think so. But considering the lack of well scripted humour it may be a push. If this is a sequel do you need to have seen the other films in the franchise? - No, but then you wouldn't pick up on the Easter eggs and nods to the first two. What words would you use to describe this film? - Action-packed, funny near the end, disappointing. What was your favourite moment or moments in the movie? - The best, and probably the funniest, was the conversation/exchange between Pegg and the alien intelligence near the end. Would you have changed anything if you could? - Yes, too many things to mention, but the script needed a rewrite at the very least. What score would you give the movie out of 10, 10 being the best and 0 being the worst? - 5/10. Good but not great. Disappointing in its execution. Having watched The World's End the day before I was really looking forward to some basic sci-fi action featuring giant robots vs monsters to perk me back up. Luckily Pacific Rim did just that. Director Guillermo del Toro is known for his visually stunning and/or action-fuelled movies like Blade II, Hellboy 1 & 2, and Pan's Labyrinth. 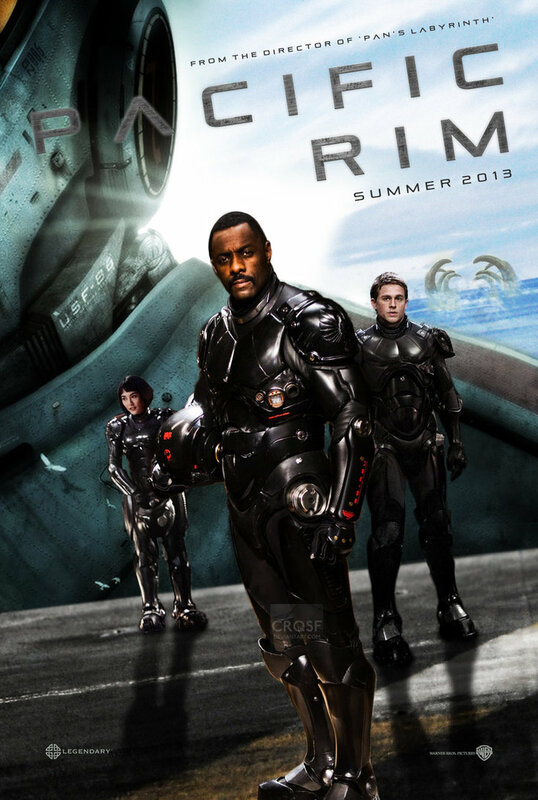 He's a pioneer of film, much like Peter Jackson, or James Cameron and when you hear that he's set to direct a robot vs monsters movie you're naturally going to get excited, and with good reason... Pacific Rim is a great film. It feels quite simple and obviously pulls decades of inspiration from previous monster staples like Godzilla or King Kong. PR feels familiar without feeling copied and putting aside any throw away story lines like the minor love story elements or rushed character growth every second that features the robots (called Jaegers) and/or the monsters (called Kaijus) is CGI/futuristic/ sci-fi-action gold. Like I said - the film is pretty simple and the script won't win any oscars, but it's pure popcorn-munching cinema epicness and it all works. Other-dimensional monsters come through a giant rift at the bottom of the sea and start attacking Earth's inhabitants. The world realises it's not going to stop (and maybe it's going to increase in frequency) so they come together to build skyscraper-tall robots to fight and kill them. The stakes rise leading to a near apocalyptic outcome and flawed characters must beat the odds to save the world. Believe me, switch your brain into suspended -belief and basic enjoyment mode and you're all good. First off, is this film good or bad? - For me it was very good. Would a non-fanboy/fangirl enjoy it too? - I guess you've got to have some sort of love for robots or monsters, but I'd say yes. If this is a sequel do you need to have seen the other films in the franchise? - It's the first, so no. I actually hope there's some sort of sequel. What words would you use to describe this film? - Action-packed, beautiful, explosive, GIANT ROBOTS VS GIANT MONSTERS! What was your favourite moment or moments in the movie? - I really liked a moment where the Gypsy Danger Jaeger comes to the rescue in one scene. Almost every scene with Idris Elba, fantastic guy. Would you have changed anything if you could? - No. I think it all worked really well. What score would you give the movie out of 10, 10 being the best and 0 being the worst? - 9/10. I'm a lifelong robot and monster movie fan so this fits right into my niche of love. Maybe not for everyone, but I loved it. I am not an Adam Sandler fan. Not in any way or form. But two of his more recent movies - Just Go with It and Grown Ups - have really hit my mark. I never thought I'd enjoy one of his movies (and yes I've seen and disliked Little Nicky and Billy Madison etc) but these two changed my mind. Grown Ups was a film that brought natural feelings of fun and joy that I didn't expect when I watched it back in 2010. It's probably because of my age and my family status in life that struck a chord and the group of actors chosen to play their respective roles were pitch perfect for the film. The sequel - Grown Ups 2 - is a film that, although not as good as its predecessor, strikes all the right chords yet again. It's difficult for me to highlight what I like about these films, but maybe the basic American potty humour, the one liners, the relationships, and the real-life reflections all feel right and the movie flows well because of that. This one loses a few of the original films characters, and adds a few more to compensate, but it's great to see all of those that were kept. Highlights include Shaquille O'Neal's scenes as Officer Fluzoo and the various cameo parts from people like Jon Lovitz, Steve Austin, little Ronnie (Kaleo Elam), April Rose, and Kriss Murrell... and all for very different reasons that you'll understand if you see the film. First off, is this film good or bad? - For me it was good. Would a non-fanboy/fangirl enjoy it too? - This is a comedy and I guess you have to have that American potty-humour gene to like it fully. If this is a sequel do you need to have seen the other films in the franchise? - Enjoyable by itself but I'd highly recommend the first one too. What words would you use to describe this film? - Funny, potty humour, accurate. What was your favourite moment or moments in the movie? - I liked it all, but the ballet recital part (which made me smile because it's totally true) and the big fight near the end were highlights. Would you have changed anything if you could? - No. What score would you give the movie out of 10, 10 being the best and 0 being the worst? - 7/10. Not as good as the first, but I love this franchise.